Miranda 2018: Your DNA can and will be used against you. CSI techs find some DNA at the crime scene … they run it through the criminal database … and BAM … they got a match and the perp is arrested. Only problem: the police database of DNA profiles is relatively limited to criminals. What about bad guys who don’t have a criminal record? Well, it seems the police have come up with a clever way to to expand their DNA files … by a lot. A lot of folks are submitting their DNA to sites like 23 & Me and Ancestry.com in order to determine (or verify) their ancestry, to fill in blanks on their family trees and, sometimes, to calibrate their likelihood of future health issues. As the Facebook fiasco demonstrated, no information is safe once you hand it over to a web site. Imagine the surprise that Joe DeAngelo got when police knocked on his door. For decades, police were trying to track down a serial murderer who went on a rampage in the 1980s, but then abruptly stopped about 30 years ago. 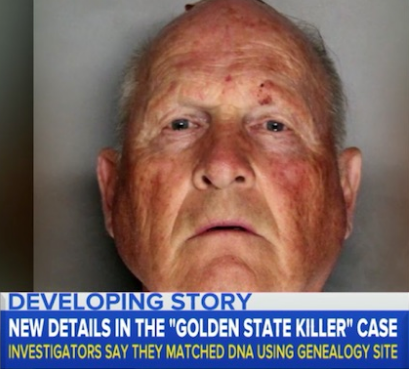 P olice were determined to bring the so-called “Golden State Killer” to justice … and leveraged the power on the internet in a unique way. The cops had a good DNA specimen from one of the crime scenes, but it didn’t match anybody in the criminal DNA files. So, according to multiple sources, the cops created a fake identity on an DNA ancestry site and submitted part of the DNA sample. The killer wasn’t dumb enough to submit his sample … so there wasn’t a direct match. But several of his relatives had submitted samples. The site’s algorithms ID’ed those relatives and reported the family tree back to the police’s fictitious person. All roads led to Mr. DeAngelo. To nail the case, investigators followed DeAngelo around until they were able to cop a sample of his actual DNA (you know, the cigarette in the trash bin trick). Pretty clever work by the police. And, while you’re probably not related to a serial killer, the process should still give you pause. As we posted yesterday, your DNA can tell a lot about you … including your likely health prospects. Making that info available to a web site may have more consequences than the Facebook privacy malfeasance. This entry was posted on May 3, 2018 at 6:59 am and is filed under DNA - Gene Mapping. You can follow any responses to this entry through the RSS 2.0 feed. You can leave a response, or trackback from your own site.